Tahiti, Bora-Bora, Moorea—just saying these names evokes the exotic, unspoiled islands that first entranced Gauguin and, later, in their 1970's heyday, the likes of Marlon Brando and the Hollywood set. Much more than a group of islands, Tahiti is a also a wonderful state of mind, seducing romantics, vacationers, honeymooners, and adventurers looking for a tranquil escape in a pristine world. Here, around Tahiti & her Islands, a romantic sunset sea sends giant curls of turquoise breaking onto the colorful reefs that protect the tranquil lagoons of warm, emerald waters, and white-sand beaches. Perfect gateway for a Romantic vacation, French Polynesia is now offering vacations for all types, no matter you'll travel with your family, looking for a robinson crusoe chartered cruise, a totally relaxing break or unique dives, Tahiti and her Islands have all you need! Which island for what purpose? The islands to visit: the top 3 islands to visit will be the classic ones: Tahiti, Moorea and the famous Bora Bora, but you can also experience remote islands like Taha'a, Huahine or Tikehau which features also romantic 3 to 5 stars resorts. These islands will offer you perfect lagoons, luxury resorts, many restaurants/bars and plenty of romantic activities. The islands to visit: In order to reduce the inter island flights budget for the family (which can be up to $500 per person), and to experience islands featuring family type accommodations we recommend you to visit the islands of Tahiti, Moorea, Huahine and Raiatea. Bora Bora can also be part of the itinerary, but the land activities are not numerous on this island, plus the accommodations are not adapted for families (except for certain bungalows types at 4 and 5 stars resorts). These islands will offer you a mix of crystal clear lagoons and tropical valleys, private villas and large family bungalows (at 3 to 4 stars resorts) and plenty of family activities. Tahiti’s 118 fabulous islands are scattered across five far-flung archipelagoes, each with their own particular character and whose inhabitants have adapted the ancient rhythms of the ocean and the sun to the 21st century. The Society Islands (made up of the Leeward Islands and the Windward Islands), is a group of high tropical islands encircled by coral reefs and lagoons. The main one of which is Tahiti, the largest of the Polynesian islands, with Papeete as its administrative capital. Tahiti is frequently used as a transit island to go to Bora Bora or Moorea only, but this island can great to visit by your own, renting a car, and take one day to discover the whole island that offers many attractions. You can also discover the interior part of the island and the famous Papenoo valley (one of the largest valley in French Polynesia) with a 4*4 vehicule. But of course to enjoy the beaches and the lagoon, this will not be your first island choice. Huahine island, the garden of Eden, is a wild island situated 175 km Northwest of Tahiti which still maintains a very lively, traditional culture, perfect to avoid tourists and experience the Polynesian life. Raiatea and Tahaa islands, are quite similar to Huahine, these two sacred islands with lush vegetation, enclosed in the same lagoon and offering perfect sailing conditions. And finally Maupiti island, the forgotten island, nestled in a jade lagoon, the smallest, and the most authentic island of the archipelago. On this island there's no hotels, only small guest houses. The Tuamotu group is a collection of low islands or atolls. a very special world, situated between sky and sea. Each island encircles its own lagoon with a ring of coral. and beneath the crystal-clear waters of each are spectacular underwater gardens and fish of every imaginable size, shape and color. It rarely rains and is a perfect environment for pearl farming. That also makes these islands the perfect location to enjoy snorkeling or diving activities. 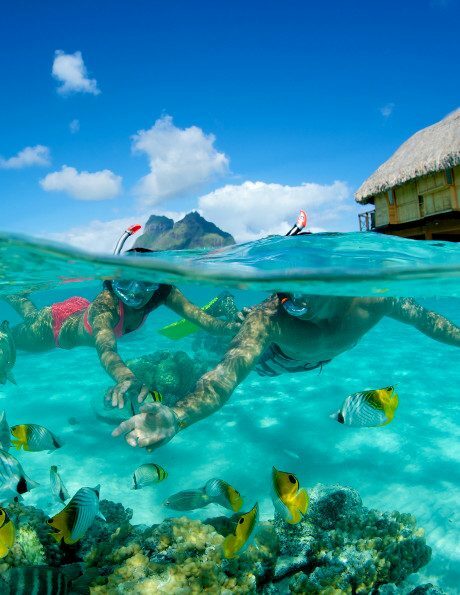 In no others places you'll get so easy access to the abundant marine life of the French Polynesia lagoons. Talking about diving, the island of Rangiroa is known to be one of the best spot on earth to see "big" fishes, but don't put aside Tikehau and Fakarava islands which offer also amazing dives. The islands of the Tuamotu have only a limited number of accommodations accessible to tourists, which means the numbers of tourists staying on these islands is small, so you'll be more quiet and you'll get more privacy compare to staying in the Society islands. These islands are accessible by plane (approx. 1H flight from the Society islands to the Tuamotu islands). Rangiroa, Tikehau, Fakarava are the most frequently visited atolls and provide classified hotel accomodation. The Marquesas, “Enua Enana” or “Land of Men”, are a group of high islands near the equator, 1 500 km away from Tahiti, whose steep mountains are inhabited by wild horses, goats and pigs. About a three hour flight from the Society Islands and the Tuamotu Atolls, the Marquesas, or Henua Enata meaning "Land of Men", are seemingly lost at the end of the earth. Natural wonders abound as 1000-foot waterfalls cascade down sheer volcanic cliffs, and towering mountains disappear into the clouds. The most well-known are Nuku Hiva, Hiva Oa, Ua Pou and Ua Huka which offer the tourist, among many other points of interest, a magnificent arboretum. The Austral Archipelago, situated far to the south, is also made up of high islands: Rurutu, Tubuai, Rimatara, Raivavae and Rapa. Last inhabited islands of the South Pacific, these ancient volcanoes with soft relief are far off the beaten track. With their marae, ancient sacred places, and majestic centuries old stone tikis, these mysterious islands still have not revealed all of their secrets. There are a variety of tropical plants and plants from temperate regions also. This environment is favorable for farming, and the Australs provide the other islands with many different vegetables. A special attraction on the Austral Islands occurs every year from June to October when the whales meet in the warm, shallow waters. The Gambier Archipelago, rarely visited, consisting of the high island of Mangareva and its fringe of islands which are the eroded remains of its former gigantic crater, is situated in the far eastern corner of French Polynesia. Although the islands of Tahiti, Moorea and Bora Bora provide over 80 % of hotel capacity, the lesser known islands are also opening top-of-the-range establishments. International visitors can savor the charm of Tahiti and her Islands’ hidden paradises in the greatest comfort while enjoying the exotic pleasures of their remote natural locations. Several international groups are established: InterContinental, Accor, Méridien, Hilton, St Regis, Four Seasons, Relais et Chateaux. Two local chains, Maitai and Pearl Resorts complete the hotel scene. Adherence to international standards and the presence of these world-famous brand names has in no way compromised the integrity of local flavor. Polynesian styles are to be found in the architectural design and the materials used that blend harmoniously with the magnificent scenery of lagoons and mountains. These include pandanus, woven coconut palms, bamboo, fine timbers and shell light fixtures. Beautifully arranged flowers can be found in hotel rooms and public places everywhere. Over water bungalows have become the symbol of island romance and stir up exotic feelings that you would expect from a trip to the edge of the world. Breakfast served from outrigger canoes is a real must that honeymooners can savor as they relax on their decks overlooking lagoons of a thousand colors. Some bungalows are fitted with glass-bottomed tables for watching the watery ballet of the demoiselles, clownfish and various lagoon species without ever getting your feet wet! Around 250 family boarding houses (“pensions”) or small family-style hotels are to be found throughout the five island groups of Tahiti and her Islands. They can accommodate close to 3,500 guests in over 1,250 units. For travelers who prefer the simplicity and authenticity of the local experience, small hotels - which are a crucial part of island development - are the ideal type of accommodation, similar in approach to the French rural cottages. The welcome is warm and friendly. Most establishments offer land excursions and outings discover little-known local trails by foot or in all-terrain vehicles, or by boat to go out on the lagoon for an unforgettable picnic. 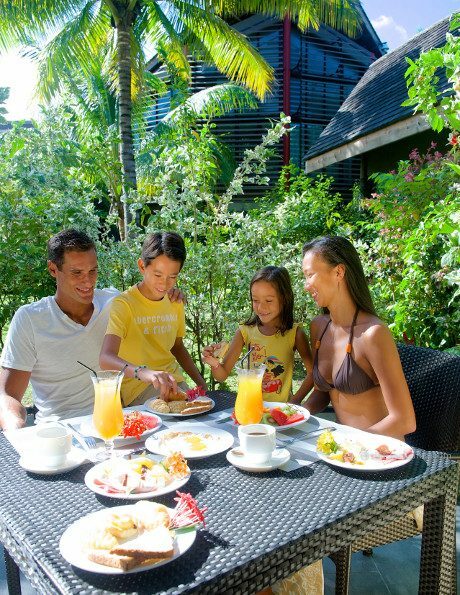 The well-planned menu of healthy, natural family cuisine, with freshly caught fish, and local fruit and vegetables is a chance for guests to savor the Tahitian culinary arts. Accommodation classifications, which have progressively been introduced since 2002, is a guarantee that standards of comfort and quality can be trusted. Factors taken into account for classification are the natural surroundings of the hotel as well as the quality of facilities and accomodation. Whether up the mountain surrounded by luxuriant greenery, or nestled beside the lagoon, these small hotels - dwarfed by nature and often built of local materials - are sure to make a lasting impression on you. “Haere mai” is the name of the Association that represents small and family hotels in Tahiti and her Islands. It is a name that literally calls you to “come and join us”. of diversely different islands. Using motorized boats, some are specialized in deep-sea game fishing and others in private luxury cruises from the larger Society Islands. They offer fishing trips, day trips that include picnics, half-day cruises and sunset- atching trips. Single-hull and catamaran sailboat companies, based in Tahiti, Moorea and principally in the Leeward Islands, offer the choice of chartering with or without a skipper or hostess for a weekend or a few days but more typically on a weekly basis. Dive cruises, laze-about cruises, discovery or honeymoon cruises - there really is a very wide range of options for you to choose from as you cruise in comfort past white, pink and purple sand beaches that fringe the unreal colors of the lagoons of the fabulous Leeward Islands or the sparkling atolls of the Tuamotu. Having your own private yacht is a great experience. It’s like taking your hotel along with you! Floating hotels, ranging in classification from “grand comfort” to “super luxury”, are a major feature of the Tahitian experience (around 700 cabins). Visiting Tahiti and her Islands, floating between sea and sky on the tides of Polynesian waters from the comfort of a luxurious cruise liner will leave you with unforgettable memories. Try the adventure cruises offered by the mixed cargo ship Aranui 5 which calls on the Marquesan bays. These services are all unique in their own way. The high islands with their imposing profiles exert an irresistible magnetism on the cruise passenger when viewed from the sea. Once ashore, one of the many organized excursions will let you immerse yourself in the picture-postcard scenery. With restaurants, beauty salons, spa pools, shops and conference rooms, the liners are furbished to the same demanding standards as the largest hotels. Theme cruises (e.g. surfing, fishing) are also available. By choosing this formula, you will enjoy the delights of the islands in unparalleled style. Nearly 50,000 visitors choose this type of cruise holiday every year. Cruises can also be supplemented with land excursions or other cruises thereby extending your visit.